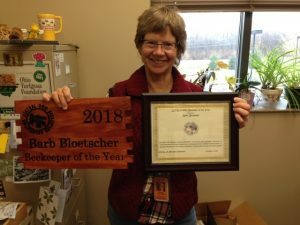 Barb Bloetscher is the state entomologist and apiary inspector for Ohio, USA. Jerry Hayes, who once held a similar post in Florida and who is now Vita’s North American VP, talks to Barb and finds out that the Ohio forage is currently insufficient for the resident bee population and what her team is doing to tackle that and other challenges faced by Ohio’s beekeepers. Hello Barb, what is your job and how has your career journey taken you from university to now? As the state entomologist and state apiarist for the Ohio Department of Agriculture (ODA), I oversee the Apiary Program and identify insects and other arthropods submitted by ODA nursery inspectors and other clients. More specifically for the Apiary Program, Ohio has 88 counties, most of which appoint and pay a county apiary inspector to inspect the apiaries in that county for pests and diseases. I train the inspectors and check the progress of their inspections as well as help solve problems that arise. I also spend a great deal of time answering questions from the public, media and municipalities regarding honey bees and beekeeping. My 35 years of keeping bees helps me understand the challenging aspects of maintaining honey bee colonies. Before my current job, I was the diagnostician for the Diagnostic Clinic at The Ohio State University Department of Entomology. That involved identifying insects and damage caused by insects plus performing extension work in Entomology. I was also the agronomic diagnostician for the Clinic totaling 23 years at OSU. Prior to these positions, I worked at a retail nursery and pest control company, all of which gave me experience working with insects and different kinds of clientele. I have wanted to be an entomologist since third grade, so I chose jobs that would provide the most knowledge and experience. Why are you leading efforts in honey bees now? Ohio has a strong history in beekeeping and agriculture. I am helping to ensure a healthy beekeeping industry, which benefits all of agriculture. Why Ohio and the Ohio Department of Agriculture (ODA)? Ohio is rich in history and diverse in geography, ecosystems and agriculture. The four corners of Ohio are as uniquely different as are the types of crops and animals raised. Beekeeping varies too, as some areas have acres of hills and pasture while other areas are farmed with row crops with commercial apiaries and hobby beekeepers within five miles of each other. Each beekeeper and apiary has its own challenges which makes my job intriguing and requiring more answers. Can you briefly describe the ODA apiary and beekeeping inspection system? 65% are hobbyists, 25% sideliners, and 10% commercial. Experience varies from new beekeepers to those with 50+ years of beekeeping. Lack of knowledge and experience is the biggest challenge. The lack of knowledge and experience is understandable: a colony of bees is a microcosm of 30,000-50,000 half-sisters and half-brothers, all with different genetic makeup and habits. Each colony is genetically different with varying needs and weaknesses. It is therefore very difficult to learn how to keep a colony of honey bees alive, especially if the person does not have a strong background in biology. We work with local bee clubs and give presentations to help educate beekeepers on new issues affecting the industry, as well as providing annual training for county bee inspectors. How can you improve beekeeper management success for hobby, sideline and commercial beekeepers in Ohio and further in the USA as a whole? Increase the educational resources available to beekeepers. Increase and improve habitat for bees and other pollinators. Produce stronger, more mite- and disease-resistant honey bee genetics. Beekeepers look in many directions for information – that includes the internet, other beekeepers, magazines and books — some of which have outdated, misleading or even wrong advice. Novice beekeepers don’t know where to turn and often don’t know which advice to follow. Good information is available online but can be hard to find. We need to develop a highly visible network of resource websites that are easy to find and provide the information and research updates to help beekeepers find the best information. The online factsheet site, eXtension, is helpful but not sufficient for all the beekeepers’ needs, while the Honey Bee Health Coalition website has not yet garnered enough attention. USDA (United States Department of Agriculture) has estimated that each colony of honey bees requires 2-5 acres of forage with sufficient quantities of nutrient rich nectar and pollen available for the entire season. Ohio has 43,000 colonies yet lacks the necessary 215,000 acres of “bee food”. We need to set more land aside for wildflowers and reduce the acres of non-flowering land. Ohio doesn’t have enough colonies for all the pollination needs in Ohio, so colonies and packages are brought from other states. Packages of starter colonies are also purchased to replace lost colonies. Many times, these colonies don’t have the ability to withstand Ohio conditions, or were raised under duress and have poor genetics. Varroa mites continue to be the primary pest of honey bees which weaken the bees and predispose them to virus and disease. Can you summarise where you have been and how you want to move forward? Ohio has been working on programs to enhance the three components needed to improve honey bee health and beekeeper success. Along with presenting information to state and local beekeeping clubs, we have partnered with STEM (science technology engineering mathematics) and other educational groups to inform students, the public and beekeepers on best management practices for beekeeping. We have worked with allied associations and state agencies to raise understanding of pollinator needs and helped with relations between growers and beekeepers. By participating in the USDA APHIS Honey Bee Health Survey for seven years, we have worked with beekeepers all over the state and collected data on honey bee health which can be compared to national results. Through the Propolis Project, ODA has helped to establish and study colonies at Wright Patterson Airforce Base which has 40,000 acres of clover, woods and wildflowers. These colonies consist of feral and Purdue “ankle-biter” stock that have kept mite levels down and flourished. Our program’s main goals are to improve the beekeeping industry in Ohio and promote local beekeepers. Through partnerships and projects, we will continue to attain our goals while maintaining compliance with Ohio apiary laws and rules.